WHAT if “we can arrange the atoms the way we want; the very atoms, all the way down”? So asked the physicist Richard Feynman in an influential 1959 lecture called “There’s Plenty of Room at the Bottom.” This manipulation would mean that information, like text, could be written using atoms themselves. In his speech, Feynman predicted that the entire Encyclopædia Britannica could be written on the head of a pin. Just over three decades later, a group of scientists at IBM managed exactly that. 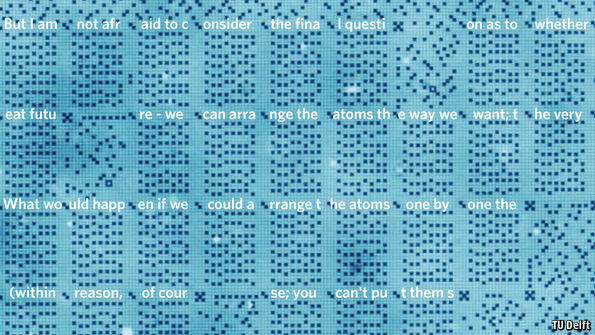 They were able to write their company’s name using 35 xenon atoms resting on a sheet of nickel—the first demonstration of precise atomic placement. Individual atoms, though, tend to jiggle around. They jiggle less as the temperature drops, so to keep the atoms in place, the researchers had to cool them to -269ºC, just 4ºC above absolute zero, the coldest temperature physically possible. That was so expensive that writing more information than three letters did not make sense. Now, a team of researchers led by Sander Otte at Delft University of Technology, in the Netherlands, have devised a better way to keep the atoms in place, paving the way for large-scale storage at the atomic level. As they report in Nature Nanotechnology, the group was able to store an entire paragraph of text (1 kilobyte of data) at the relatively balmy temperature of -196ºC. That may not sound like a big change, but such temperatures can be achieved with liquid-nitrogen cooling, which is much cheaper than the liquid helium used in the IBM experiment.